While a bike is designed to carry us from point A to point B – sometimes we find that we end up being the ones that need to carry it. 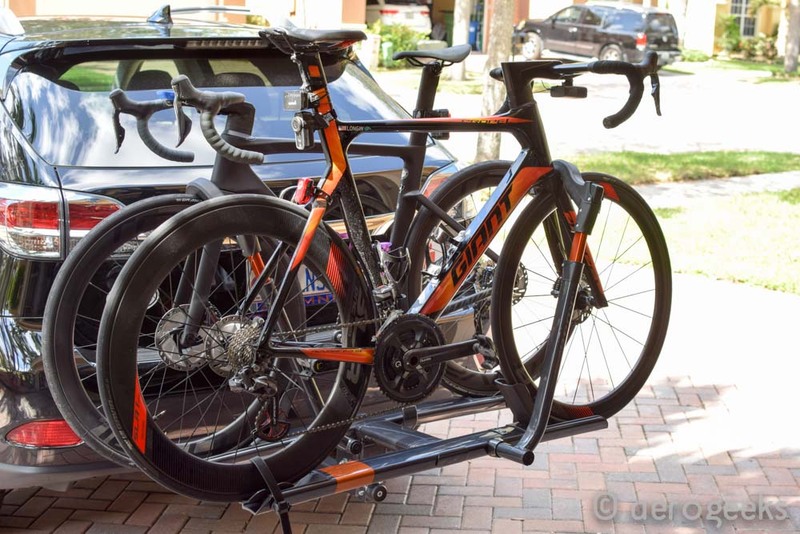 Whether it be to get to your local bike shop for a tuneup or on race day. Sometimes you just need to strap your bike to your car and get going. And Kuat has been one of our favorite solutions for quite some time now. 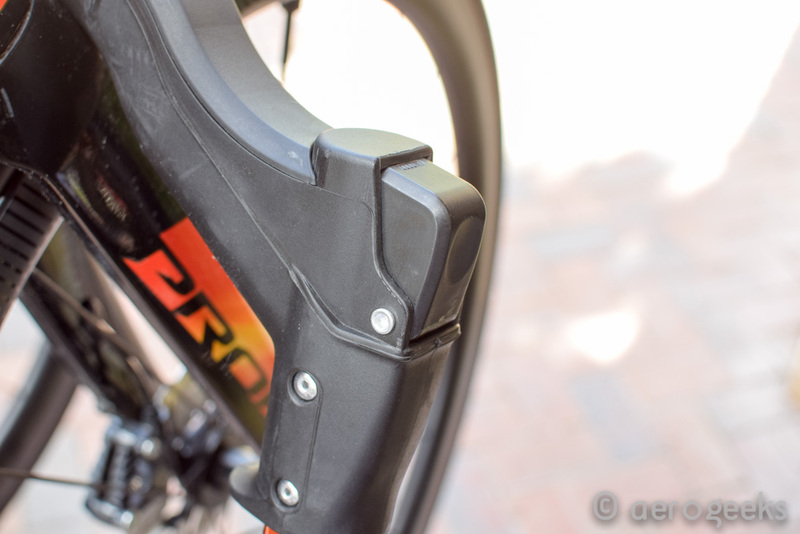 (If you happen to have a way back machine you can find a first generation Kuat Sherpa in our review of the Profile Design Aero HC System.) So when Kuat gave us the chance to check out their second generation Sherpa we jumped at the chance. For those not familiar with the original Sherpa lets cover the basic. The Sherpa is Kuat’s “mid” level tray style rack (the NV being their top of the line model). Tray racks fold up against your vehicle when not in use and you rest your wheels in the “trays”. The Sherpa is built to handle 2 bikes with a max weight of 80 lbs (40 lbs each). The bike is secured to the Sherpa via a strap for the back wheel. And in the front is an arm that ratchets down to lock it securely in place. Now the Sherpa 2.0 is an all new design. And when they say that they weren’t kidding. Nearly every piece of it is upgraded versus the original. Starting with how you secure it to your vehicle. 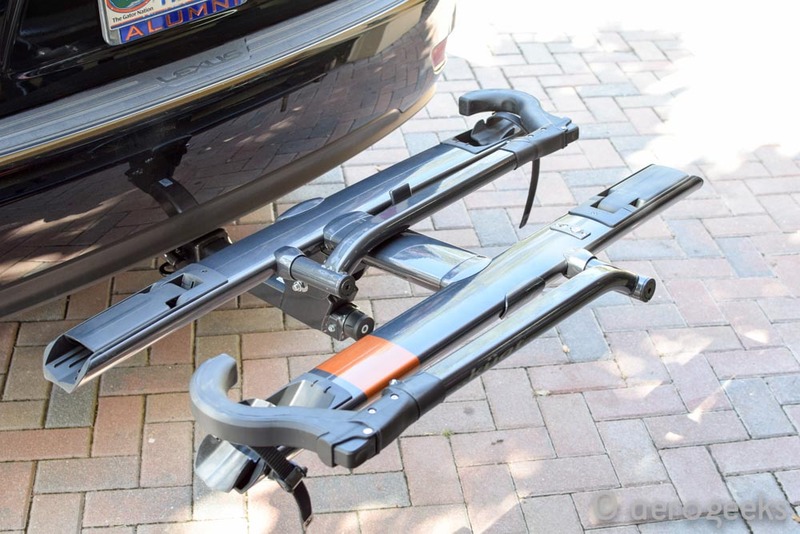 While both versions use an expanding cam system to lock it onto your hitch, the previous versions was an always on handle while the new version uses a much more streamlined grip. For us we found it to be one less thing to bump our shins into when the rack was in the stored position. Next up is the new foot assisted pivot lock. Previously lowering the tray was a two handed operation. One hand operated the pivot lock – the other pushed down on the rack. For anyone that has tried to balance a bike using just their derriere – you know how much fun that can be. The new system is simple and brilliant. One hand holds your bike (or coffee/beer), while the other lowers the trays for loading. A definite and appreciated upgrade. The Sherpa 2.0 also does away with the permanent front tire cradle of the original. 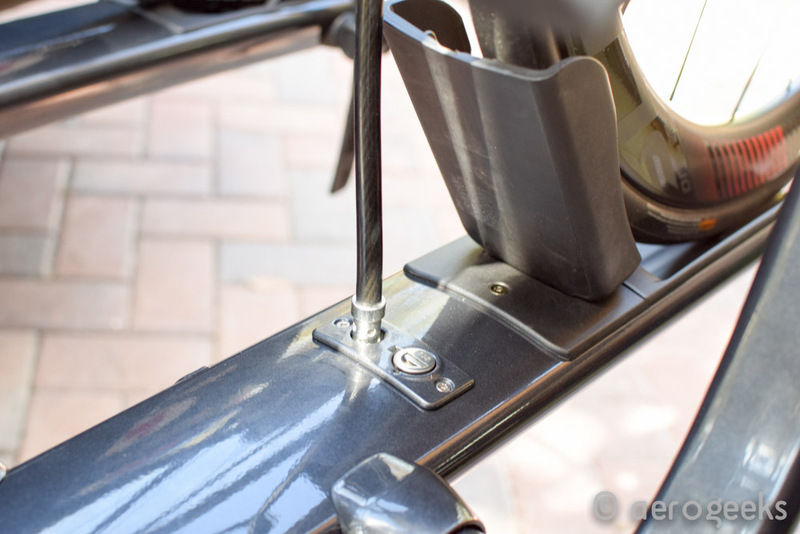 The cradle helps provide stability for your bike when it’s locked into position. While a definite necessity, the original’s could sometimes rub up against your rear bumper when the Sherpa was folded up. (On our previous version we had to do some dremel based surgery to correct for this). The 2.0 features a folding cradle design that closes cleanly when not in use and completely solved this problem. For those that like to grab Starbucks (or an adult beverage) after a ride. The Sherpa 2.0 adds a semi integrated cable lock. Unlike the NV the cable is not contained in the rack itself (you have to leave it in your trunk) but the lock is built into the Sherpa so you aren’t left worrying about whether you grabbed it while running out the door. For those that don’t just ride skinny road tires, the Sherpa can handle wheels up to 3” and wheelbases up to 47”. When loading 2 bikes you get 14” of spacing between them. The Sherpa 2.0 is available in 3 powdercoat colors – grey metallic with an orange stripe, black with a grey stripe, and white pearl metallic with a silver accent. Each retails for $498. Any new Kuat starts with the build process. Some may choose to let\pay your local bike shop to do the work but personally we think you are better off doing it yourself. Kuat makes it super simple to build – even utilizing the box itself to help support the rack as you build it (we think Apple would be proud of that!) Kuat includes all the tools you will need for the build process. Quality tools that we found were worth keeping after the fact (unlike the cheap allen wrenches you find from most furniture stores). Once you get it built, placing it on your vehicle is a simple process – simply slide the rack onto the hitch receiver and hand tighten. Kuat includes a hitch locking pin to ensure no one finds your new Sherpa so much they want it for themselves. 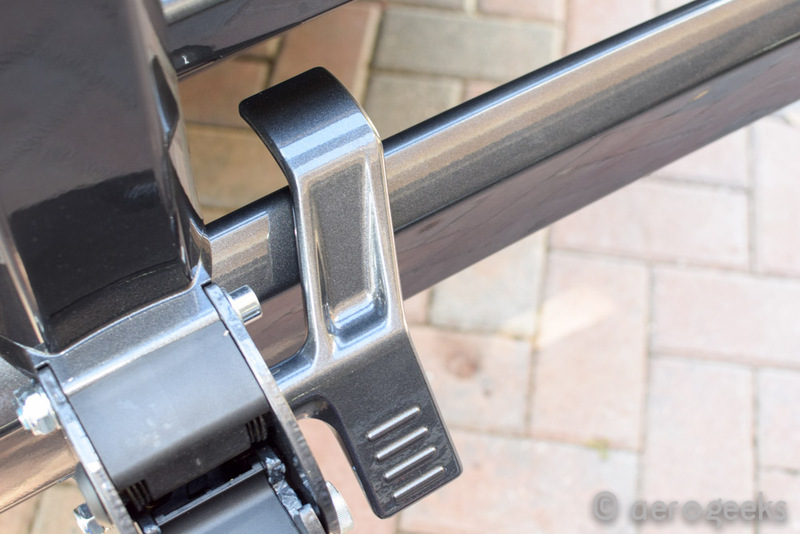 When you are ready to load your bikes, use your foot to push the pivot lock and pull the rack down. You have to then swing the front tire arm up and open the front cradle. 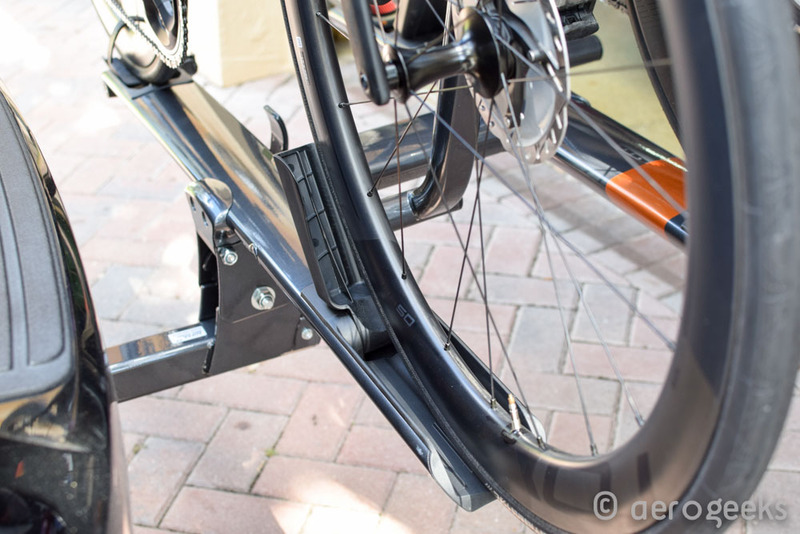 Drop the bike on, ratchet down the front tire arm, and use the integrated rear strap for your back wheel. Nice and easy – something one person can do in less than a minute. The Kuat Sherpa 2.0 is a major upgrade over the original but that doesn’t mean there aren’t a few places where improvements could be found. First we have to mention the price – at $498 it’s in line with its competitors – especially in the Tray Mount space. 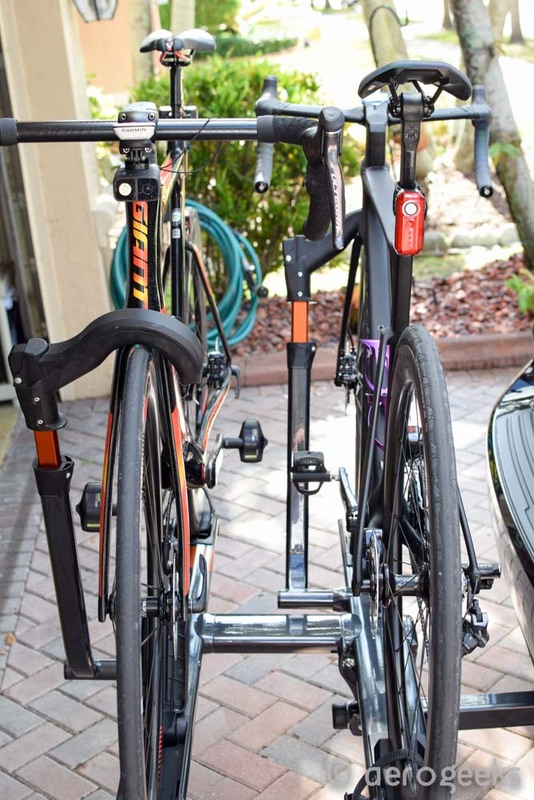 But that doesn’t mean there aren’t cheaper bike rack options out there for you to consider. The previous generation could also handle 80mm and deeper wheels without an extender or strap. (The NV couldn’t but offered a strap extender that solved the problem.) 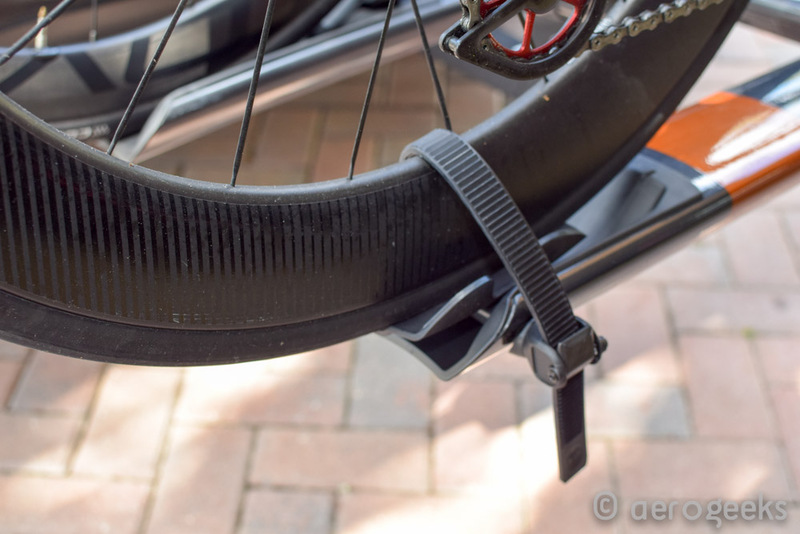 The Sherpa comes with fabric velcro straps to solve for this but it just doesn’t feel to have the same quality as the standard straps – we would have loved to have seen either a larger strap for a 80-90mm wheel or strap extenders again. Finally (like the NV and Sherpa before it) when using a disc wheel you cannot use a strap to hold the rear wheel down. We found the best we could do was flip the bike around and use the front tire arm for the rear wheel (but we were not huge fans of this). Regardless of the improvements we listed above – the new Sherpa is a definite step forward from the original. Our first Sherpa lasted for 5 years on one AeroGeeks vehicle after another – we suspect this Sherpa will do the same. In fact due to the new foot operated pivot lock we have replaced our first generation NV with the Sherpa 2.0 as our primary bike rack. And when the second generation of the mid level product beats the first generation of a company’s halo product – you know they have built a winner.